Despite plenty of obvious differences, chordates -- the group of animals that includes humans -- and the echinoderms -- the group of animals that includes starfish -- share a relatively close evolutionary relationship. Both belong to the deuterostomes, animals grouped together based on the way their embryos form in the earliest stages of development. However, these groups have many major differences. Echinoderms and chordates have different types of symmetry, one of their most obvious differences. Chordates like humans have bilateral symmetry, which means you can divide them into a left and right half, and that they have a defined top, bottom, front and back. Echinoderms have radial symmetry, which means you can divide them in various cuts along the center and get equivalent shapes, and have only a defined top and bottom. It can help to visualize the difference if you consider that hotdogs in a bun have bilateral symmetry, while hamburgers have radial symmetry. Echinoderms and chordates also have very different nervous systems. Echinoderms' nervous systems consist of a neural net without any kind of central point. Chordates have a central nervous system, called a notochord or a neural tube. In many chordates, the end of the notochord is enlarged to form a defined, centralized brain -- a feature no echinoderm has. This goes hand in hand with anteriorization, the formation of a head at the front of an animal. This allows chordates to concentrate their sensory structures in one area. Echinoderms and chordates also have very different skeletal structures. Echinoderms have a dermal skeleton, similar to an exoskeleton, or a shell-like structure called a test. 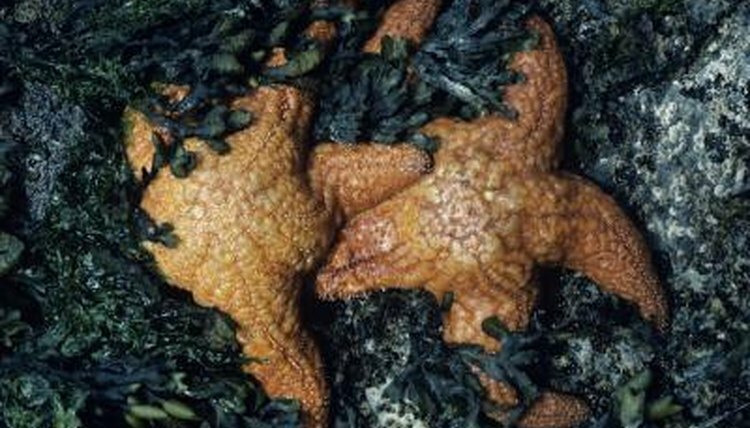 Sea stars have interlocking calcium-based plates that form their dermal skeleton, while urchins have test, covered with spines. Most chordates have some kind of internal skeleton. The internal skeleton usually consists of bone, like in humans, or cartilage, like in sharks or rays. In fact, one of the defining structures of chordates consists of a cartilage structure that supports the gills. In humans, this feature develops into the thyroid gland. Most rules in biology have exceptions. For example, many vertebrates lose key features as they develop, and they may only have them during their earliest development stages. For example, a major subgroup of the chordates, the vertebrates, replace their notochord with a spine during development. At the same time, a few echinoderms like the sand dollar have bilateral symmetry. Scientists believe that echinoderms evolved from animals with bilateral symmetry. One of the oldest fossil echinoderms, the Homalozoa, has bilateral symmetry.